Is there a way to make my terminal (konsole) display different text colors when I'm in an ssh session WITHOUT modifying the remote host's color configuration? Like, maybe automatically switching to a different profile? Konsole can use these different "profiles"
I want to basically change to a different profile when in an ssh session. So that instead of the default being green on black, change to black on white or something. It doesn't necessarily have to use this profile setting. But if xterm or something has a setting to do this that would work too. The idea is to work on ANY ssh session, not just particular sessions with particular machines. Ps = 4 ; c ; spec -> Change Color Number c to the color specified by spec, i.e., a name or RGB specification as per XParseColor. Any number of c name pairs may be given. The color numbers correspond to the ANSI colors 0-7, their bright versions 8-15, and if supported, the remainder of the 88-color or 256-color table. What this means is that the control sequence \e]4;NUMBER;VALUE\a will change the appearance of color NUMBER. NUMBER is a color number (0–7 for the eight basic colors, 8–15 for the bright versions, and more if the terminal supports more colors). The VALUE is something that XParseColor understands, such as an RGB specification #123456 or an X color name (look for rgb.txt on your machine, or use xcolors to see the possibilities). Note that this changes every character currently displayed in this particular color in the window. There is no way to change the meaning of a color only for subsequently displayed characters; if that's what you want, you'll have to configure each program displaying inside the terminal to use different color numbers when talking to the terminal. Having this happen exactly when you're typing in an ssh session will be very complicated, but handling the common cases is reasonably simple: use a wrapper around ssh that changes the color palette, then runs ssh, and finally changes the color palette back. Examples of cases this won't handle are suspending the ssh process and running ssh inside screen or tmux. Does Konsole have a place on one of its settings tabs along the lines of "Run a custom command instead of my shell"? 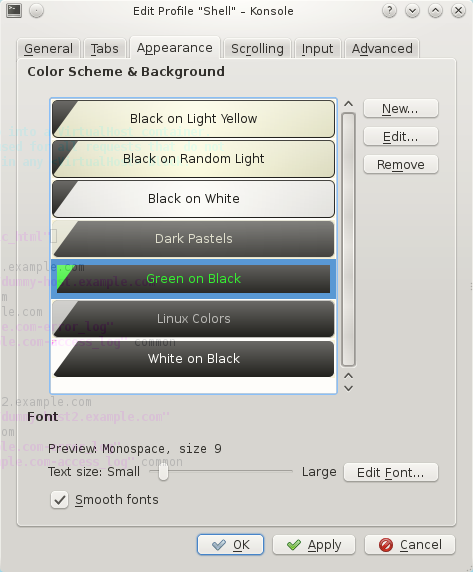 Create a profile with the color scheme you want. Check the "run a custom command" box. With that setup, you can simply open a new tab with the selected profile, and it will automatically connect to your SSH session and have the color scheme that you want. This does, however, have the drawback that it doesn't work for just any SSH connection (as written above, you have to set up a profile for every SSH connection, though you can probably write a script that allows you to enter in the remote host when you open up that profile), and you have to open the profile specifically, unless you set it as your default profile. Not the answer you're looking for? Browse other questions tagged shell ssh colors konsole or ask your own question.